Appearance: (1) After peeling back the plastic sheathe, we were met with a presentation reminiscent of some of our least favorite stadium nachos. Boring and ugly, though we appreciated the splash of color provided by the salsa. Quality: (1.2) Some of the guest patrollers on this trip might argue this with us, but we’ve done enough reviews to know bad quality when we taste it. Yes, the cheese sauce was about on par with something purchased from the canned goods isle of your local 7-11 and the chips were surprisingly crunchy, but any joy these Lunchables gave us can probably be credited more directly to our dining locale rather than the actual fare. 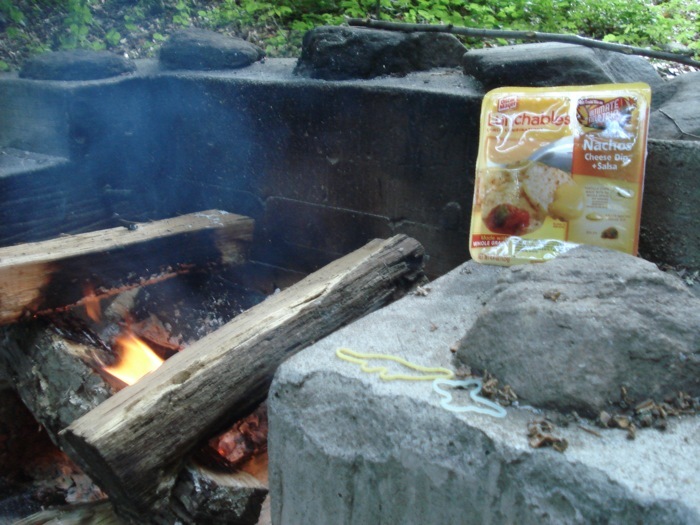 Sorry Tim…Things just taste better around a camp fire. Distribution: (.9) Distribution? Who would have heard of such a thing?! They get exactly .9 points for realizing to make the chips smaller, thus avoiding the dreaded “nesting chip” syndrome. Price: (10) We can’t be certain about this, but it’s tough to beat $1. Of course, individual results (and grocery store 10 for $10 sales) may vary. If desperate times call for desperate measures (and in this case, they most certainly did), then Lunchable nachos might just be the snack for you. We grew up eating Lunchables, and though we would never feed these to our children, it’s a comfort to know that even when you find yourself in Bumblefuck Campground, NY, you can still reverse the positive effects of fresh air and exercise by busting open a box of ‘chos. Ha. We’ve talked about this before, but we never had the heart to go forward with it. Lee, we recommend tensing your shoulders, gritting your teeth, girding your loins, and just jumping in. It’s also a good idea to have at least three people there to help you out when you can’t go on any longer.